10:30 am. - 2:00 pm. Top Dog has more than 24,000 sq. ft. of outdoor play in 4 separate yards. Three of them have special k-9 grass artificial turf so the dogs never get muddy or messy and we don't need to worry about digging or about pests. When it rains, we can still be out playing. There are kiddie pools and sun umbrellas in all the yards and a 34 ft. in-ground, heated swimming pool in one. The pool is open mid April through mid November. The labs and goldens and all the water dogs start their day swimming. Then in the afternoon we move them to another yard and give them a chance to dry off a bit before coming in from play. 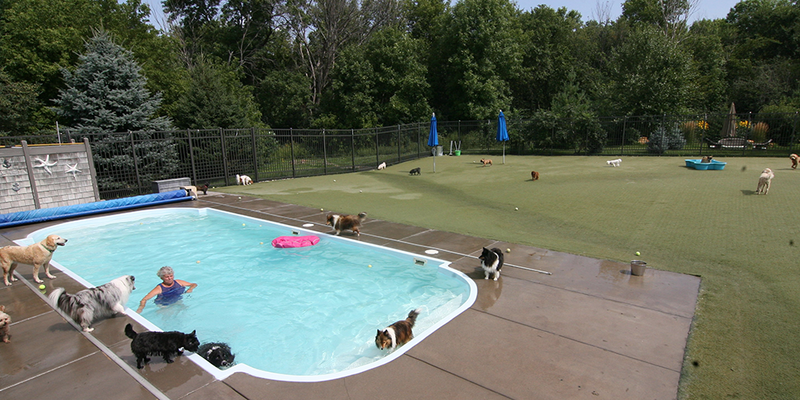 That gives the little dogs a chance to take a dip in the pool, lounge on the floaties and swim with the staff. All the yards are nestled against a backdrop of Austrian and white pines and maple trees. Dogs enjoy fresh air and the sounds of the birds singing. Being out in the country, we have no noise restrictions so the dogs can play and bark with delight! We also have a senior sanctuary yard for those senior dogs that need a less active group. It is filled with trees and shrubs, a park bench and an umbrella. They can just lounge in the grass and watch the other dogs play . . . and enjoy the birds and the butterflies.